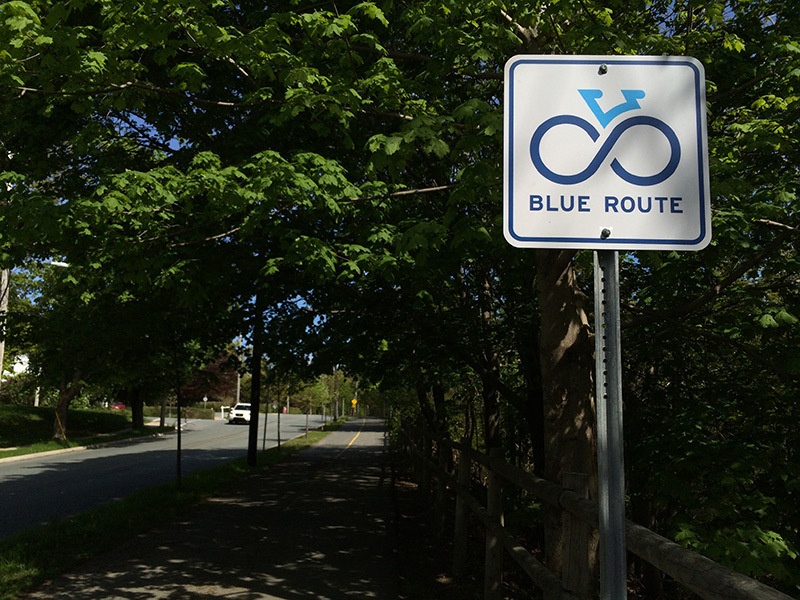 2007 – Following a year of casual inquiry, Bicycle Nova Scotia applied for funding to initiate a feasibility study about the concept of the Blue Route. This was solidified at the 2007 Bicycle Summit held in Pictou. Funding was obtained by the Department of Health and Wellness and awarded to Eastwind Cycle to conduct interviews, host community consultations, and draft an initial report on the Blue Route. 2008 – “Scoping the Blue Route” – Phase I Blue Route Report was published in May 2008, confirming that cyclists, municipalities, and the province all had an interest in providing a wide network of bikeways. 2009 – “Communicating the Vision, Building Support, and Strategic Partners” – Phase II Blue Route Report, published in January 2009, was another significant step in providing a framework for the Blue Route. 2011- Interdepartmental Active Transportation Committee was struck, facilitating conversations and planning between relevant provincial governmental departments. 2012 – Funding awarded to Bicycle Nova Scotia from the Department of Health and Wellness to hire a full time staff as Director of Blue Route Implementation. 2014 – Interdepartmental Blue Route Team Committee was formed, co-chaired by TIR and Bicycle Nova Scotia. Bicycle Nova Scotia received funding from the Department of Energy through the NS Moves program to conduct province-wide consultations on the draft map to help shape proposed routes. Funding provided by QUEST (Quality Urban Energy Systems of Tomorrow) allowed for branding redevelopment, a Blue Route website, and project launch. 2015 – Blue Route Implementation!